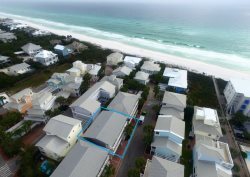 New 30A WaterColor Vacation Rental House includes bikes! Nestled in the Crossings District of the WaterColor Resort you will find 231 Wisteria Way. This new 4 bedroom home (completed May 2017) offers chic coastal décor with hardwood floors throughout the home. Upon entering the home you walk into the open concept living, dining and kitchen area. The living room has a large flat screen tv, the dining table seats 8 with additional seating for 6 at the kitchen bar. The kitchen features Dacor stainless steel appliances, a stand alone ice maker and Carrara marble countertops. Just off the kitchen area is a laundry room with a full size washing machine and dryer. From the laundry room there is a door leading outside to the rinse off shower (perfect for rinsing off after a day at the beach). There is also a powder room for added convenience. Further down the hallway, is the first bedroom with a queen bed, flat screen tv and ensuite with a single vanity and shower/tub. The main floor also features a large screened porch perfect for relaxing, with the comfy couch and chairs or you can dine alfresco after grilling on the gas grill. As you reach the second floor, you walk into the large kids’ area, with 2 twin size bunk beds (total of 4 twins) and a fun denim couch to relax on. The second bedroom is located down the hall with 2 full size beds, flat screen tv and a shared balcony. This bedroom shares a bathroom with the kids’ area. The bathroom is a unique Jack and Jill bathroom with 2 separate vanity areas and a shared shower. The third bedroom has a queen bed, flat screen tv and ensuite with a single vanity and shower. This bedroom shares the balcony with the second bedroom. The master bedroom (fourth bedroom) has a king size bed, flat screen tv, large walk-in closet and an ensuite with a double vanity, soak tub and glass enclosed shower. The master bedroom also features a large private balcony with outdoor seating. The booking lady (Lexis I think) was super helpful. Jessica the property manager was also super helpful.